Personalized Pill Tube Keychains, Custom Printed in Bulk. Promotional, Inexpensive. Red, White, Blue. Best price in USA, Canada. Bulk personalized hard plastic pill tube key rings. Food-safe plastic material. Holds pills or other small items. We also supply blank wholesale pill tube keychains at EQP (End Quantity Pricing): $2.19 each. Free artwork design. Budget Prices in USA and Canada for bulk personalized pill tube key rings. American clients pay no taxes. Prices include a 1 color, 1 side imprint. Set up charge is $40.00. 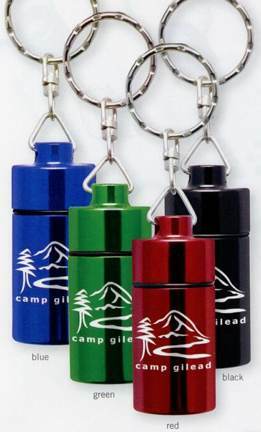 Additional imprint color: add $0.30 per pill tube keychain. Setup Charge: $40.00 per imprint color. Production Time: 3-5 days after art approval. Contact us for faster delivery. Blank pill tube key rings ship next day.